It’s been a real challenge setting up a house and home in Samoa, but we’re making some progress now. We’ve spent a large part of the last month pushing through with setting up on the land in Falelauniu, actually more up by the Aleisa Road. It’s a good patch of land with a nice breeze wafting up the hill and a good temperature to live in – certainly in the shade of the trees – compared to much of the lower and hotter areas in Samoa. Debbie has her garden under way. 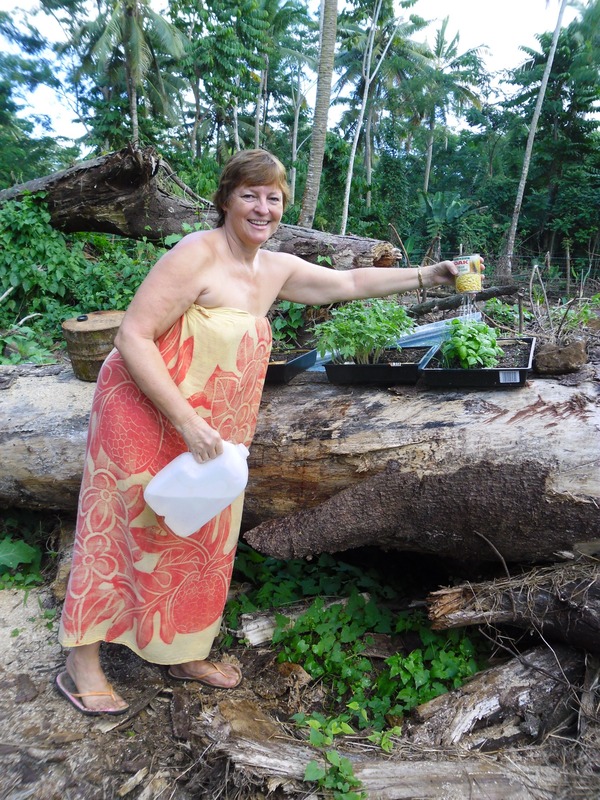 A lot of time and energy has gone into clearing the land – trees chopped down with machete and stumps dug out or pulled out – mostly by hand and the garden will do well in time in the tropical growing conditions. We have bananas and coconuts producing already from previous owners’ planting going back generations but the rest will take time to develop. Our first WWOOFer volunteers have been and gone now (www.wwoofsamoa.com) one guy from Germany, two from Italy and another two from Argentina. Thanks to their help, the gardens are big enough to plant out and quite a few little things have been sorted – like water, generator power and now the Internet! A pleasant surprise came last week with Samoa Tourism Authority finally wanting to talk with us meaningfully. It’s taken 18 months and has been a long drawn out saga that began for me a week or so after the Tsunami in October 2009 when I first offered my services to the Prime Minister. At the time he asked me to speak to Sonja Hunter, CEO of STA and suggested to her that she see if they could use me. In the interests of burying the hatchet and goodwill we won’t go into details about the delays, but various things have now “happened” 18 months later and it looks like SWAP and STA may be able to work together in a much closer way. This was always my long-term goal, so I’m pretty pleased to be starting to have meaningful dialogue with them. Creating a home is way more than just building a house. Emotional, financial, social and matters of faith all roll into the equation and it’s a major life-changing event. Every new path, pipe and plant though represents another step in a pretty challenging journey, setting up in a new country. Overall, Debbie and I are pretty pleased with the new land and what we’ve achieved in only a few short weeks. More to do but good progress every day. Churchill was my childhood hero for whom I was – literally – prepared to die. I now see him for what he was; a drunken, unscrupulous, corrupt, cynical, racist, immoral, dishonest, self-serving arch-traitor. [He] became an icon by combining outrageous chutzpah with cunning, deception, duplicity & unmatched eloquence. I have just retired from the military here In America and I am making my way back to Samoa to purchase a piece of land and build a house on it. If you don’t mind me asking, what is the average monthly payments on a loan for land purchase and what did it cost you to build a house. Thank you so much for your time. Unless you are a Samoan citizen you cannot buy land. It takes 5 years to become a citizen. Interest rates are high in Samoa http://samoaobserver.ws/home/headlines/11826-westpac-bank-breaks-new-ground. Housing can be anything from $50k WST to $250k WST. If you want to marry local you can buy land through your wife. If you go into business you can also secure land if you have a Samoan business partner. There are also other ways to achieve stability and a future for yourself in Samoa. It’s a lovely place to live in some ways and many will no doubt be looking at doing the same thing as the NWO developments progress. Skype me if you want to talk more. I am wanting to know how much it would cost to build a 3 bedroom home in Letogo Samoa. My husbands family own the land and we all here in Nz are going to put x amount of money in to have it built. The majority of my inlaws were born in Samoa but are now NZ citizens. The idea is to build a home for all our children/grandchildren so when they visit, they have a home that they are accustomed to, to stay at. I assume there are all sorts of permits we have to get and much to sort before we even start. Between $40,000.00WST for a small unit and $150,000.00 for a larger home. You will be best to speak to the Letogo village and ask them which builders they use and then use them. Be VERY careful not to part with money until the work is done stage by stage or week by week; ensure that the materials have good controls/security on them and retain enough so that if things are not finished to your satisfaction then you can complete it with other builders. It is normal for builders to not complete work they’ve started and many a person has rued their trust to part with cash only to be left short! Permits are relatively easy – your builder will arrange that or you can do it yourself submitting your plans to MNRE yourself. Be careful and good luck! Thanks so much for your prompt reply. I will take all your advice and carry it with me when we travel to Samoa. Being NZ born, I have queried and am not sure about how things work. All I know is the palagi way and how it should work and that’s what I’m going with. It’s quite hard to do when different cultures are set in their own ways. All I know is, we will all have a say since all our money is going into this project. Once again, thanks so much. Can you please tell me an estimated cost of a samoan fale with an iron roof and concrete floor? Measurements will be 12 metres by 8 metres. Can you please include a cost for 24 poles? I am planning on building on my land in Falemauga and wish to find a construction company to do the job. Would you happen to have a list of reputable builders who will do the job well please? I am just looking to find a group who will just do the job, get paid without all the unnecesary formalities? Sorry Hilary I don’t off the top of my head but I’ll ask around and let you know if I find someone who can help. Hi do you know any companies that can make you a deal from overseas to organized the building of your house and a home loan and then i can pay the loan from here as i now lived in Australia. I like to help my inlaws in savaii upgrade their house but i dont want keep sending money but its better to talk direct to someone that can help with this. Yes Lola. You can contact me offline and I can help you. Hello how much will build a three bedroom house in Aleisa please.I am planing to build a house .I have a land there but I’m still looking around and want to know how much will cost.